Our primary training aircraft is a Cessna 172. This aircraft is tried and true. It has been a preferred aircraft for primary students since the 1970's. This particular plane has been updated with a new panel. Among the more noteworthy, this plane is equipped with a Garmin 430 GPS Navigation System. The Piper Arrow qualifies as a complex aircraft, which makes it our advanced training aircraft. What qualifies it to be a complex aircraft? Its retractable gear and its constant speed propeller. This plane is also equipped with a Garmin 430 GPS Navigation System and a pretty sweet paint job! She will dazzle you! 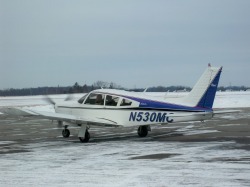 Multi-Engine training is offered in a beautiful, low time Piper Aztec. This is a true twin engine aircraft with old school charm. This six seat airplane will blow you away as you learn to fly in it. This plane is also equipped with a GNS530 GPS system, auto pilot, HSI, and traffic display.